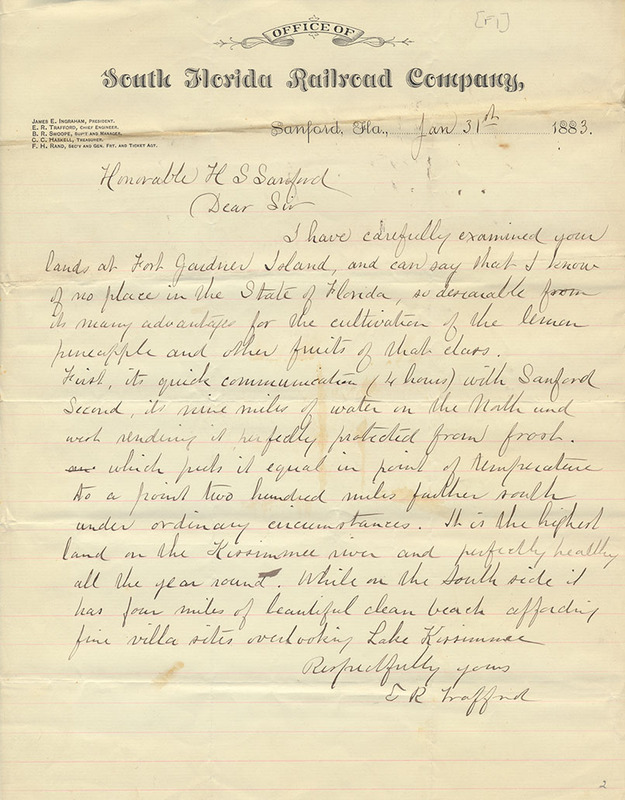 A letter from E. R. Trafford to Henry Shelton Sanford (1823-1891), dated January 31, 1883. In the letter, Trafford assessed the value of land owned by Sanford at Fort Gardiner Island. In the letter, he concluded that he knew "of no place in the State of Florida, so desirable from its many advantages for the cultivation of the lemon[,] pineapple[,] and other fruits of that class." He also stated the Fort Gardiner Island was attractive because of its relative proximity to the city of Sanford and its position on Lake Kissimmee. Trafford was a company agent for the Florida Land and Colonization Company (FLCC) from 1882 to 1886. The FLCC was a joint-stock venture that invested in Florida land development and sales in the 1880s and early 1890s. The company was formed by Henry Shelton Sanford (1823-1891) with help from a group of British investors. The original impetus for the company's formation was Sanford's inability to continue his land acquisition and development efforts in Florida independently. Located at 13 Austin Friars, the company was officially registered in London on June 10, 1880. With the formation of the FLCC, all of Henry Sanford's Florida properties were transferred to the company in exchange for a £10,000 cash payment and another £50,000 in company stock. Sanford was named President and Chairman of the Board.In 1880, the company owned 26,000 acres scattered across Florida, including in the cities of Jacksonville, St. Augustine, and Sanford, as well as in Alachua County and Marion County. Original letter from E. R. Trafford to Henry Shelton Sanford, January 31, 1883: box 54, folder 18, subfolder 54.18.2, Henry Shelton Sanford Papers, General Henry S. Sanford Memorial Library, Sanford Museum, Sanford, Florida. 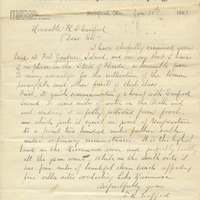 Digital reproduction original letter from E. R. Trafford to Henry Shelton Sanford, January 31, 1883. Donated by the General Henry S. Sanford Memorial Library, Sanford Museum in 1960.
citrus; Florida Land and Colonization Company; Florida Railroad Company; Fort Gardiner Island; Lake Kissimmee; real estate; Sanford; Sanford, Henry Shelton; South Florida Railroad Company; Trafford, E. R.
Trafford, E. R.. “Letter from E. R. Trafford to Henry Shelton Sanford (January 31, 1883).” RICHES of Central Florida accessed April 22, 2019, https://richesmi.cah.ucf.edu/omeka/items/show/4302.